Committed to safeguarding consumer health and safety, JMDA Design, are pleased to announce they will be supporting The Royal Society for the Prevention of Accidents (RoSPA) having made them their chosen charity for 2019. RoSPA who have a vision for a life, free from serious accidental injury, campaign globally to reduce serious accidental injuries. The JMDA design team, passionate about supporting the wider community and promoting health and safety, have pledged to become members of RoSPA this year and raise money to fund the charity’s Brighter Beginnings Appeal. 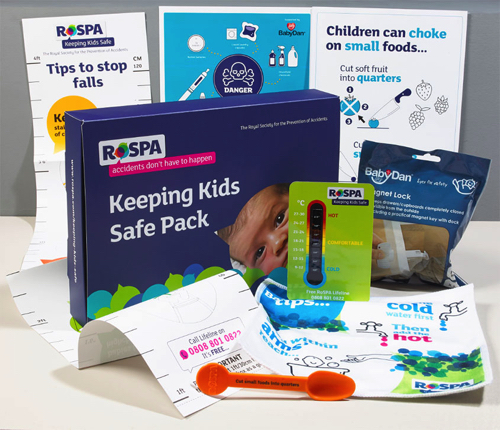 This appeal raises particular awareness of RoSPA’s Keeping Kids Safe pack designed for disadvantaged parents/parents-to-be and carers of children under the age of five. Along with lifesaving safety tips and tools, the free pack includes useful products such as an easy-to-fit cupboard latch, a nursery thermometer and a falls prevention height. The JMDA team are eager to start fundraising for the society and have an exciting calendar of charity events planned for the forthcoming year. RoSPA work hard to campaign on issues which save lives and reduce injuries and has been instrumental in shaping society for the better, preventing millions of deaths and serious injuries along the way. Over the years they have successfully campaigned for the wearing of seatbelts to be compulsory and for safer foam furnishings. The society have helped pass fitted-plug legislation and raised the profile surrounding the dangers of using handheld mobile phones in cars. JMDA, who have a particular specialism in the development of child car seats, have led the child car seat industry for many years. JMDA are industry leaders in the design of high-end design solutions, focused on producing even safer and better performing child car seats to meet the needs, demands and regulations set by the industry. Besides child car seats, staff at JMDA, with their engineering expertise, also design a variety of nursery products in addition to robust electronic solutions and user centric consumer products. Their portfolio includes such products as the award-winning Wallace Cameron first aid kit, Stannah stair lift, and Fire Angel smoke alarm.